North Attleboro, 58 vs. Bishop Feehan, 37 – Final – North Attleboro limited Bishop Feehan to just 15 points in the opening half, building a 32-15 lead by the break and never looked back. The Rocketeers pounded the paint, using their size to their advantage, connecting on 26 two-point field goals. Jake Petersen had a team-high 14 points for North while Josh Montague added 10 points, sophomore George Ladd finished with nine points, and Nate Gonsalves chipped in seven points. Taunton 72 vs. New Bedford, 66 – Final – New Bedford raced out to a 24-14 lead after the first quarter, and had the lead up to as much as 15 before Taunton closed the gap with a big second quarter. Senior Lou Vendrell scored nine of his 11 points in the second quarter on three triples to help the Tigers cut the deficit to just two, 31-29, at halftime. Senior Mike Quinn scored 15 of his team-high 17 points in the second half, Wesner Charles added 14 points, and John Martins scored all 10 of his points in the second half to help the Tigers earn the win. Canton, 57 @ Weymouth, 48 – Final – Canton got strong games from three of its freshmen to win on the road at Weymouth (where the Bulldogs clinched a playoff spot last season). Kiara Cerruti led the way for the Bulldogs with 19 points, including 6-of-8 at the line. Sydney Gallery scored 12 and her sister Fay chipped in with 11 points. Canton coach Jim Choquette credited the team’s defensive pressure and its transition game for the win, which moved the Bulldogs back to .500 on the season. Foxboro, 54 vs. Walpole, 40 – Final – The Warriors won a second non-league game in a row to stay unbeaten on the season. Katelyn Mollica was the top scorer for Foxboro with 14 points and the Warriors also got strong games from Yara Fawaz and Chelsea Gibbons, who each scored 13 points. North Attleboro, 61 @ Weston, 42 – Final – North went on the road and earned its first win of the season. Julia Feid scored 20 points to pace the Rocketeers and Eliza Dion added 12 points in the victory. Sharon, 43 vs. Holliston, 49 – Final – The Eagles stormed back into the game in the fourth quarter but it wasn’t enough to catch Holliston. Kaitlyn Wallace had 12 points, Evanjuline Elisma had 11, and Telishya Herbert had eight in the loss. Attleboro, 0 @ Canton, 9 – Final – Canton senior Ryan Nolte scored a hat trick and six other players found the back of the net as the Bulldogs opened league play with an impressive win over Attleboro. King Philip, 2 @ Foxboro, 1 – Final – King Philip dominated in shots but had to kill five penalties and needed a late third period goal to earn a win over Foxboro. The Warriors, who had a 36-9 advantage in shots, went ahead in the first period on a goal from Jack Coulter, assisted by Luke D’Amico. Foxboro tied the game on a tally from Brendan Tully (unassisted) with 2:23 to go in the second period. KP sophomore Rocco Bianculli scored the game-winner on a feed from senior Brendan Shandley and junior Chris Daniels. with 2:36 to play. Foxboro had a power play over the final 1:39 but the Warriors’ best chance hit the post in the final moments and stayed out. Oliver Ames, 2 @ Franklin, 4 – Final – Click here for a Recap and Photo Gallery from this game. Franklin, 3 @ Canton, 2 – Final – Click here for a photo gallery from this game. – Franklin senior Regan Paterson scored a pair of goals and assisted on another to pace the Panthers to a key road win. Paterson opened the scoring just 53 seconds into the game, using a self pass off the boards to beat the defense and then finished with a nice shot. Franklin made it 2-0 with a power play goal with 3:10 left in the first. Tina Pisano played the puck behind the net, Paterson collected it, and found Jordan Dwyer open in front for a goal. Canton got on the board with 1:10 left in the second period as Leah McClellan found Katie Trerice, and her shot from just inside the blue line found its way through traffic and into the net. Franklin responded with a power play goal early in the third. Pisano found Cassi Ronan streaking into the area and she connected with Paterson right in front. Lauren Fitzpatrick scored with 1:18 on the power play to bring the Bulldogs within one. Gabby Colace made 33 saves in the win for Franklin. Sharon, 37 @ Canton, 26 – Final – Click here for a Photo Gallery from this dual meet. – Sharon’s Vinay Chinnam (126) and Tyler Cashton (152) earned pinfall victories and the Eagles got 18 points from forfeits to earn a win over Canton. Huguens Pierre (138) and Max Pozner (145) also had wins for the Eagles. 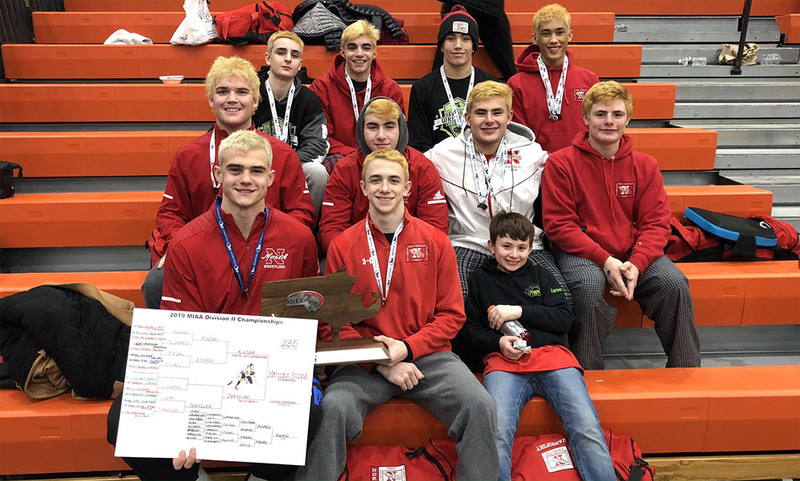 Canton’s Zach Peters (106, dec.), Jack Turano (113, pin), Mark Carstairs (120, dec.), Harry Carter (152, pin), Jordan Neundorf (160, dec.), and Cole Murphy (170, dec.) had wins for the Bulldogs. Oliver Ames, 10 @ Franklin, 57 – Final – Click here for a Photo Gallery from this dual meet. Taunton, 24 @ King Philip, 53 – Final – Six Warriors won by pinfall and two more won by decision as King Philip picked up a win over Taunton. Conor Harrington (106), Michael Gorman (113), Sam DeBaggis (126), Jackson Kelley (138), Sean O’Brien (170), and Shawn Conniff (195) all won by pin for KP while Mohammad Lofti (145, 16-0) and Luke Fitch (182, 4-0) each won by decision without giving up a point. Taunton’s Tyler Lima (120, pin), Christian Balmain (152, dec.), Candido Santos (160, dec.), and Woudanly Danger (285, pin) picked up wins. Oliver Ames, 74 @ Franklin, 93 – Final – Junior Chris Carey took first in the 100 free and junior Pat Juszczyszyn won the 500 free to pace the Panthers to a win. Oliver Ames, 93 @ Franklin, 74 – Final – Franklin senior Katie Cashin was a double winner, taking first in both the 100 free and 20 free. Oliver Ames, 130.4 @ Canton, 102.75 – Final – Oliver Ames picked up its third straight win to begin the season, with junior Lauren Picanzi capturing his third straight first place finish in the All Around. Picanzi scored a 33.7 while OA sophomore Ashlyn Latham was second with a 32.8. Latham had a meet-best 9.0 on the vault. Attleboro, 5 @ Ashland, 1 – Final – Jake Parker scored four goals for the Bombardiers and P.J. Elliott scored the fifth. Canton, 2 vs. Newburyport, 0 – Final – Tommy Kilduff scored the opening goal off a Brad Murphy assist in the third period. John Hagan added an empty net goal with 30 seconds left to wrap up the win. Quinn Gibbs had the shutout in goal for the Bulldogs. Stoughton, 9 @ Apponequet/Connolly, 2 – Final – Stoughton sophomore Sean Doherty scored a hat trick to pace the offense. Ryan Chipman and Jon Lessa each added a pair of goals for the Black Knights while sophomore Luke Bainton scored his first career goal. Peckham Tournament (Canton, Sharon) – Canton took second overall with 243 points at the 20th annual Peckham Tournament while Sharon grabbed fourth place with 176 points. Norton won the tournament with 289 points. 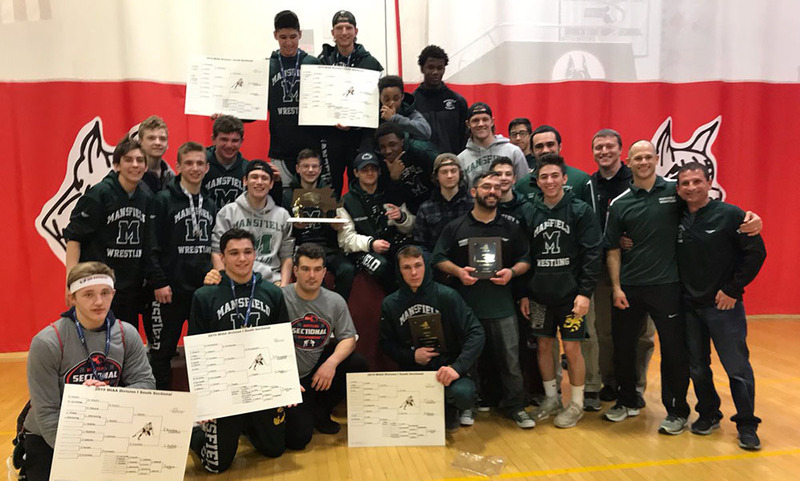 First place finishes for Canton included Harry Carter (120), Eddie Marinilli (126), Anis Chakir (132), Joe Pacitti (152) and Mark Whalen (220). Sharon’s Ian Langol-Leonard won the 195 bracket. 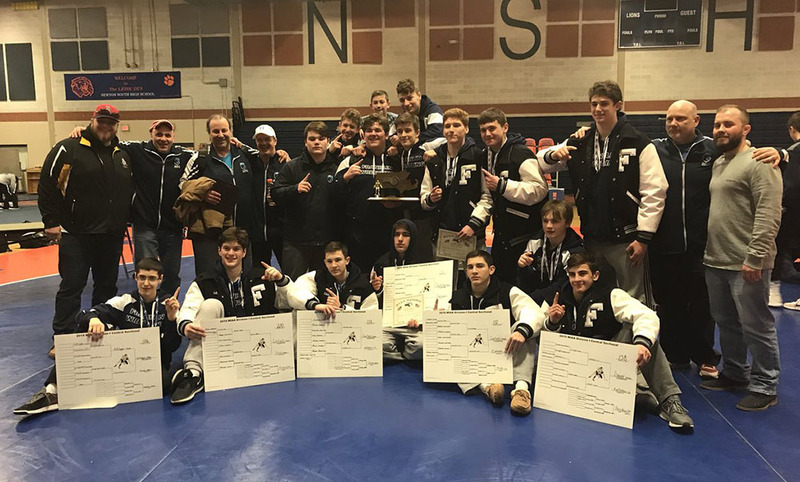 Oliver Ames, 137.3 @ Attleboro, 141.5 – Final – Oliver Ames totaled its highest all around team score in four years but fell just short to Attleboro. OA sophomore Gianna Martucci placed third in the all around with a 35.75, scoring an 8.9 on both vault and bars, an 8.75 on beam, and a 9.2 on floor. Freshman Lauren Picanzi placed fourth overall with a 35.2, scoring an 8.8 on vault, 8.9 on bars, 8.6 on beam, and an 8.9 on floor for the Tigers. OA junior Charis MacCuish tied for first on the bars with a 9.4. King Philip, 133.95 @ Attleboro, 141.5 – Final – According to athletic director Mark Houle, this was a school record score for the Bombardiers. Franklin, 0 @ Canton, 6 – Final – Canton junior Marissa Devane potted a hat trick to pace the Bulldogs. Mansfield/Oliver Ames, 4 @ Stoneham, 2 – Final – Shayna Menzer scored a pair of goals for Mansfield/OA. Isabelle Shantler and Kenzi Fraser each scored a goal in the win. CANTON, Mass. 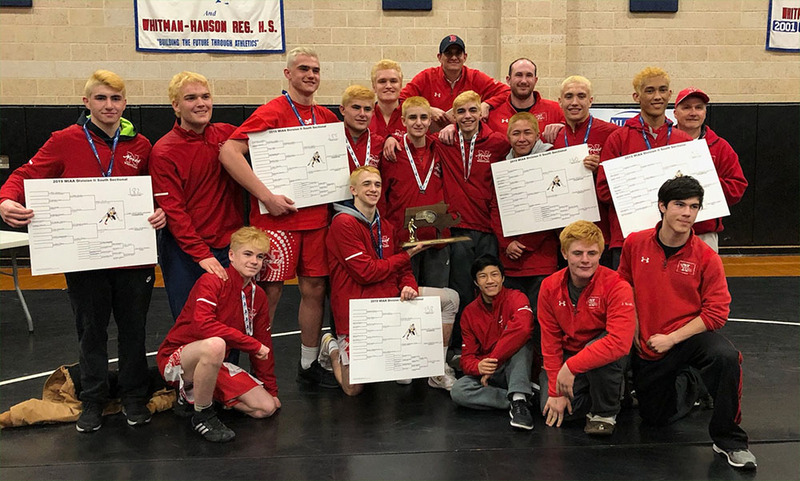 – Early in Wednesday night’s dual meet in the Canton High gym, the Bulldogs looked at home on the brand new mat, winning four matches in a row and taking the lead over visiting Mansfield heading into the 138-pound weight class. Canton’s Max Gallagher had the lead after the opening round and seemed to have control of the match in the second with a 5-2 advantage on Mansfield senior Stephen Healy. The match and possibly the whole dual meet turned in an instant when Healy squirmed out of a hold and flipped Gallagher. He went from the edge of being pinned to winning the match and earning six points for the Hornets. When the ref slapped the mat, the Hornets bench exploded out of its seats to celebrate the turn in momentum. Mansfield won 145 at a walk over and then took four of the next five matches, three of them by pin, to seal the victory. Canton would earn pins in the final two matches of the night but the Hornets walked away with a 37-34 victory. Antonio Sevastos started off the night with a 2-0 victory at 106 pounds to put Mansfield ahead 3-0, but the hosts went on a roll with four straight wins to take control. Justin Dickie had a second round pin at 113, Harry Carter won 8-2 at 120, Eddie Marinilli just held on long enough to edge Will Stratton 3-2 at 126, and Anis Chakir rolled to a 12-4 major win at 132 for a 16-3 lead. Healy found a way to pull out his match and after the Hornets won by forfeit at 145 the lead was down to just one point. Although it is difficult to overcome a missing weight class, Canton bounced right back with a second round pin by Joey Pacitti on a big reversal. Sophomore George Glaropolous got a first round pin at 160 that got Mansfield back to a one-point deficit at 22-21 and then his classmate Jayden Curley pulled off a big win at 170 to give the Hornets their first lead of the night. Curley battled Canton senior Brandon Lentol and the pair traded near falls in a high-scoring opening round and Curley took control in the second, building an 18-6 lead. But in the third round Lentol started to get back into the match, cutting the lead to 10 and then as the horn sounded he seemed on the edge of putting Curley on his back only to have time run out. It was a big win for the younger wrestler, particularly because he was one of several Hornets who had to move up a weight class for the dual meet. Freshman Vinnie Holmes was another who bumped up and he rolled to a first round pin at 182. Shane Cremmen sealed the victory for Mansfield with two matches remaining, getting a first round pin to push the lead to 37-22. Mark Whalen (220) and Nick Matt (285) ended the meet on a high note for the Bulldogs with back-to-back pins. “We’re still trying to learn to win on a consistent level and we’re right there. I think we’re right on the cusp of doing great things,” said Caffelle. With the win, Mansfield improved to 6-1 on the season, which is just one shy of the win total for the Hornets in all of 2015-16. This even more impressive considering the vast majority of the roster is underclassmen. Mansfield will try to keep its momentum in a Super-Quad at Plymouth South before the prestigious Marshfield Tournament. Canton will head to the Lowell Tournament next week, which is one of the top tournaments in the state year-in, year-out.